The world of Prosecco changed since August 1, 2009. 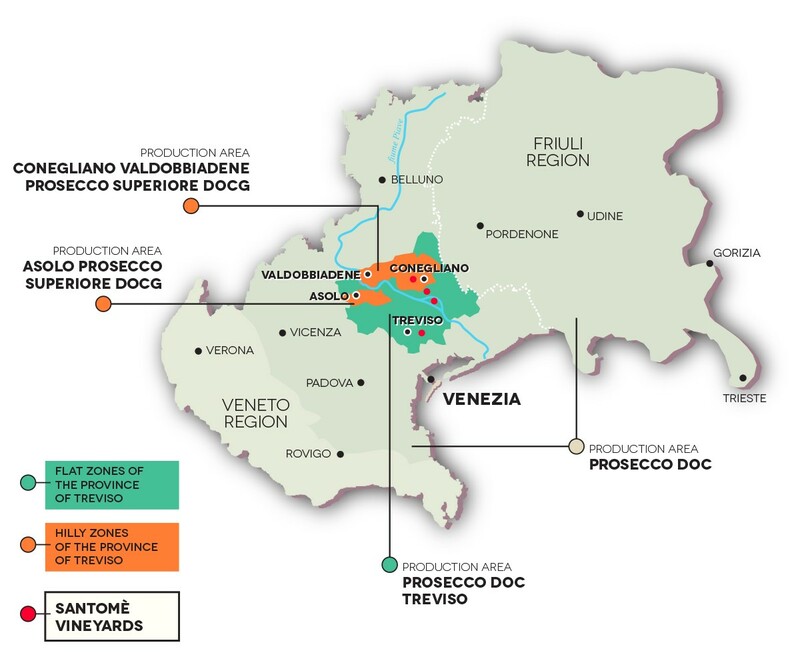 The word Prosecco no longer refers to a vine, but a territory subject to precise rules located in the regions of Veneto and Friuli and more precisely in the 5 provinces of Veneto (Treviso, Venice, Vicenza, Padua and Belluno) and 4 of Friuli (Gorizia, Pordenone, Trieste and Udine). The wine with denomination of controlled origin “Prosecco” must be obtained from grapes coming from vineyards made up of the indigenous vine “Glera“: a historical name, father of the current Prosecco, present in the Treviso countryside since the times of the Roman Empire. The denomination Prosecco Doc is the largest in the world with its 540 million bottles sold in 2017. It is therefore a great pride to be among the ambassadors of this great wine famous all over the world. The province of Treviso represents the home of Prosecco, both historically and by the vocation of the land: in fact, it contributes to today with over 65% of the production out of the total of the vineyards existing in the 9 provinces. In all the other provinces it is possible to produce only the Denomination PROSECCO DOC, but without using the name of the province to which it belongs. 75 hectares of Santomè are all located in the province of Treviso, in the heart of Prosecco. 3 hectares are in the hills in the heart of Prosecco Superiore Docg Conegliano Valdobbiadene in the location of Collalto di Susegana. A sunny slope called “Bosco Coste” with mainly light clay soil, which helps enhance the floral and fruity notes essential for the production of Prosecco Superiore Docg. 23 hectares mainly in Glera – Prosecco – extend in the valuable and pristine Papadopoli Island, rich in silt and sand: an oasis of the Piave river of 750 hectares protected by FAI (Italian Environment Fund). This island, sacred to the Homeland, is famous for the presence of numerous vineyards cultivated since Roman times. 4 hectares in Tezze di Vazzola, the first vineyard Santomè. It is located along the left bank of the Piave river, with mixed soil of silt and clay, rich in mineral salts, particularly suitable for the cultivation of Prosecco.